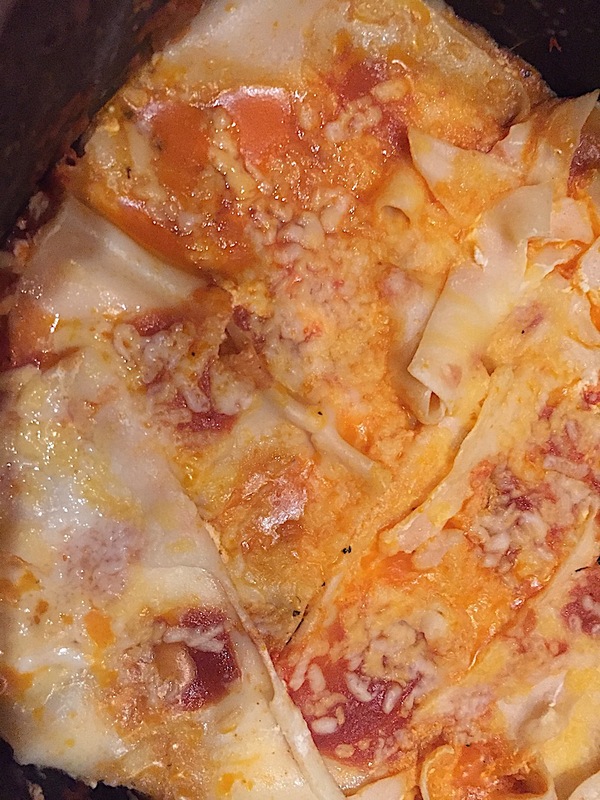 This entry was posted in Essays about food, Food and tagged easy recipes, essays about food, lasagna, Recipes on June 14, 2018 by lifelessons. My Excuse and I’m Sticking to It!!! I had a marathon cooking day yesterday. I’d been shopping, and bought a kilo of hamburger, four Italian sausages and two huge chicken breasts. In addition, I had 1/2 a roasted chicken I’d bought the day before along with vegetables that needed to be used, a bag of pearl barley and a variety of condiments. If I’m going to mess up the kitchen, I’d just as soon cook as much as possible and freeze it, so in about 4 hours, I made a Chinese sweet and sour chicken/peanut casserole, the beef and sausage tomato sauce for a lasagna to be made later, stuffed green peppers, a big pot of cooked barley and a heavenly chicken salad. Most of these I froze. The unfrozen stuffed pepper I intend to have for dinner tonight, but there was a little bowl of chicken salad—just enough to make into a sandwich, and although I’m trying to cut down on Diet Coke, a large open liter bottle that would just go flat if I didn’t drink it soon. It wasn’t until I’d eaten two bites of the sandwich and was about to have my first drink of Coke that I remembered a happening from the day before. Yolanda was mopping the floor in another part of the house and I was sorting out kitchen drawers yet another time, trying to put the things I used most in the top drawer, removing to the outside bodega some seldom-used implements, and consigning the rest to a lower drawer. When I got to the plastic bag of saved wine corks, bottle tops and the rubber plugs to reseal wine bottles, I picked out a little flapped pourer to put in the top of a wine bottle, wondering if I’d ever use it. Then I noticed the fixture at the bottom that indicated it was meant to be screwed into something and suddenly remembered that it was actually the top to a long aluminum finger filled with liquid that was meant to be kept in the freezer, then when needed, to be screwed into the capped pourer part and put in an opened bottle of white wine to keep it cold between pourings! It had been a gift from a friend and I kept the bottom part in the door compartment of my fridge freezer, but unscrewed the top and put it in the drawer because it didn’t fit in the compartment. Then I suddenly remembered that three days before, I’d put just the metal part into a 2 liter bottle of Diet Coke that I was taking to a pot luck dinner! And remembered I’d thrown that empty bottle away when I got home! And the trash can was empty! I called out to Yolanda and asked if the garbage truck had come yet. She said no and as we started to rush out to see if the vital element of my wine cooler was in the trash bag she put on the curb, it suddenly occurred to me that surely I would have noticed the long metal rod in the empty bottle. I then remembered pouring the remains of a 1/2 empty bottle into another bottle, opened the fridge and found a full bottle of Diet Coke. I shook it and heard a clunk!!! When I poured the bottle out into a pitcher, I could see the comforting flash of aluminum and recovered what I had thought was lost! RELIEF. I funneled the Diet Coke back into the bottle, cleaned the aluminum shaft and restored it to it’s compartment in the freezer. All was right with the world. So it was that when I made my sandwich today and spied the opened Diet Coke in the door of the fridge, that I decided I’d better drink it before it went flat. And so it was that I filled a glass, added ice, grabbed my sandwich and made off to my desk and computer. Bite of sandwich. Check a few blogs. Another bite of sandwich. Long pull on that glass of Diet Coke. Surprise!!! Only then did I remember that before I left for the potluck, I had laced the bottle of Diet Coke with anejo rum!! Easier than taking two bottles and mixing them there. And that is how I came, at 1 p.m. on June 5, to be an early drinker. Tasted pretty good with the chicken salad. I wonder how it will taste with one of the chocolate chip cookie brownies I made last night? This entry was posted in Essays about food, Favorite drink, Food, humorous essay, Uncategorized and tagged anejo rum, drinking and dining, food, forgetfulness, humorous essays on June 5, 2018 by lifelessons. The thing about a midnight supper is that it’s gotta be good but it’s also gotta be fast. This means raiding the fridge to see what can be easily and quickly thrown together. Tonight it was a bowl of Mama Memorial Goulash and a Rootie Tootie Margarootie. As good as they are pretty. Lovely glass is courtesy of friend Patty who won a set along with a basket and bottle of tequila in a silent auction to benefit Operation Feed, a local charity that provides food, clothing and scholarships for about 500 people in our village. This entry was posted in Essays about food, Food, images of food, Recipe, Uncategorized and tagged food, goulash, midnight supper, Operation Feed, Recipes, rootie tootie margarootie on May 4, 2018 by lifelessons. I woke up with the lyrics, “Hey, good lookin’, whatcha got cookin’? How’s about cookin’ something up with me?” going through my head. Later in the morning, Yolanda caught me holding the paws of Diego, sort of dancing back and forth with him and singing the same lyrics to him, giving him a kiss on either side of his jaw between each line. I must admit, this went on for longer that just one repetition of the entire song. As a matter of fact I think I recall singing it at least three times. He was a willing recipient of all this attention and entertainment. When Yolanda finally could stand it no more and had to exit out to the patio, smiling broadly and laughing at my antics, it brought an end to the silliness. I restored Diego’s paws to their rightful resting place on the stone floor of the terrace and went back to whatever normal activity I was engaged in before the lapse into the Busby Berkeley imaginative actings-out of my youth. But, around ten o’clock last night, those lyrics staged a return engagement in my brain with the result that I just had to bake a cake. Now, I must admit that I haven’t baked a cake in at least 15 years—probably longer, but since I had grated carrots as well as eggs in the fridge, carrot cake seemed a reasonable goal. Further checking of ingredients revealed that I lacked four of the key ingredients: crushed pineapple, butter, raisins and agave nectar. In addition, I’m sure the flour in my freezer was at least a couple of years old if not, in fact, 15 years old. My nutmeg was sadly out of date, but luckily I’d been prescribed cinnamon in capsule form to combat cholesterol, so I merely broke open a few capsules for the required tsp. and a half. By now, it was firm in my mind that carrot cake was indeed what I should be cookin’, and so I figured out the proper substitutions. The solid canola-oil low-calorie spread would sub for butter. Cranberries would be better than raisins, and a mixture of low-calorie maple syrup, honey and sugar would do in lieu of the agave nectar. The closest I could come to crushed pineapple was a can of mandarin oranges which I cut into tiny pieces. I cut up a cup and a half of nuts, creamed the sugary products and eggs, poured spices, getting at least half on the floor, mixed ingredients and filled the cake pan. Two hours after I had started, I pulled an almost-perfectly cooked carrot cake out of the oven–– Perhaps just a tad too dark around the edges, but firm in the middle and not really burned. Success! Now for the powdered sugar glaze. I tried three versions. The one mixed with pina colada soy milk tasted soapy. The one with orange juice and vanilla was too acid, the one with the juice of mandarin oranges too metallic. Finally I settled on green apple soy milk, a splash of vanilla and powdered sugar. By now I was almost out of powdered sugar due to my former testing of flavors, so I just sorta drizzled it over the top of the cake before cutting a section out of one corner. Hmm. It tasted not sweet enough, too light in texture and rather dry. The solution? I sprinkled the rest of the box of green apple soy milk over the top and popped it into the fridge to cool down and sog up a bit. Well, yes, of course I cut a piece to taste first. Then another. I’m not sure, but perhaps later I came back for a third. Each time it tasted a bit better. I had a sinking sensation that instead of 1.5 tsps. of cinnamon that I’d added 1.5 Tbsp., but all-in-all, it wasn’t the worst cake I’d ever eaten. There was something about it that reminded me of the rather strongly odd-tasting cakes my 90ish year old grandmother used to bake. Once she had mistakenly substituted liniment for vanilla, but I think that was not her usual practice. Actually, it looked even worse than this, but I had already cleaned up half the mess before okcforgottenman demanded that I take a photo. You know okcfm? He’s the one who a minimum of two times a day tells me, “That would make a good blog post. Did you take pictures?” Well, sometimes I take his suggestion, and this is one of those times. okcfm says the words carrot and cake just do not go together in his mind. Has he ever actually tasted carrot cake, I ask him and he says no, and he never will. His loss, I think, but actually I’m not too sure I’d want to break him in on this one anyway. Here’s my inspiration. Have a listen. It may make you want to bake a cake. Or dance with a dog. This entry was posted in Essays about food, Food, images of food, Uncategorized and tagged cake, carrot cake, dancing with dogs, essays about cooking, essays about food, Hank Williams, humorous essays, image of cake, Recipes on May 20, 2017 by lifelessons. When he wasn’t ranching or farming or drinking coffee in Mack’s Cafe, this is where my father could normally be found. At the Amana Colonies on a visit to my sister who was attending Cornell College in Iowa. As you can see, my father cleaned up well. The wheat shown above and in this jar was collected by my oldest sister from the last wheat crop before we sold the ranch. I brought it with me to Mexico, where it sits over the cabinets in the kitchen. A stalk of it usually extended from between his teeth when he was out inspecting a field come June or July. It collected in his pants cuffs and in the hat band of his broad-brimmed work hat. Bags of it wintered in a huge pile that filled our garage one year when there had been a good crop and all the barns and silos were full to bursting. The cars stood outside in the gravel driveway just off the alley and behind the garage that winter and our house was strangely empty of mice as they took shelter in the garage instead. Our outside cat grew fat even though he rarely came to the back door to be fed. Ours was a little ecological system all its own. Mice feasted on grain spilled from burst seams in the garage. The cat feasted on the mice and we feasted on the steaks of Black Angus cattle who had eaten the ensilage from wheat stripped of its grains. If I have always worked hard to furnish the bread and butter of my life, it is wheat that has furnished the dessert–my college education, my first car and, after my dad died and I inherited 1/6 interest in the farm and ranch, my first house. Our lives were run by wheat and cattle. During the summer, no time for family vacations. Wheat and cattle were my dad’s alarm clock. He rose before sunrise every morning and was often asleep in his chair before sunset, wheat spilling out of his pants cuffs or high top boots or stuck by the hooked spines of its beards to the fabric footstool in front of his rocker. He slept hard, my father, and rose early to insure everything worked to the cycle of the nature that had surrounded him from the time, as a three-year-old boy, he had stepped off the Union Pacific train that had brought him and his mother to the little South Dakota town both he and later I grew up in. As they descended the metal steps, my grandmother had held one hand down to grasp the hand of my three-year-old father. The other was extended upward, holding a cage with two canaries. My grandfather and teenaged aunts were there to greet him and my grandmother, who, even though she had been the one who decreed that they should leave their safe security in Iowa to claim a homestead on the Dakota prairie, had not traveled by wagon, but instead had sent her young girls and husband on ahead to prepare a way for her and her youngest. My grandfather––a Dutch immigrant who was not a farmer, but rather a baker better suited for working with wheat in its miled state––did what most people did when my grandmother issued demands. He complied. It made for a hard life for them all–fighting the harsh South Dakota winters out on the plains as well as prairie fires, plagues of grasshoppers and schizophrenic weather that could furnish either drought, unseasonal rain or hail–all of which could ruin a wheat crop. So that later, when I asked my dad why he never frequented the games parlor where the other men played poker and lofted a beer or two, he said that he had no need for games of chance. His whole life as a rancher and farmer had been the biggest gamble of all. My grandparents never did learn the correct formula, but my father, surrounded by the prairie from age three to seventy, learned its secrets well. Enough to buy out his parents as well as others who tried and failed. Enough to ensure the comfort of his wife and children and his grandchildren. Enough to die at what, now that I am nearly 69, seems like the young age of 70. Year after year, as he tilled the rich South Dakota soil to plant the grains of wheat he’d saved to seed a new crop––he seeded my life as well, along with that of my mother, my sisters, my nieces and nephews–all of our lives growing and prospering from those millions of shafts of grain that he planted and watched over and harvested and stored and replanted over a period of fifty years. This entry was posted in Essays, Essays about food, Essays about thanks, Eulogy, faamilies, Fathers and tagged dad, Daily Post, Daily Prompt, essay about my father, farm, grain, wheat, wheat harvest on May 25, 2016 by lifelessons. I don’t usually keep potato chips in the house anymore because I can’t be trusted with them, and cottage cheese is so expensive in Mexico that I don’t usually buy it; but when I make a trip to Costco in Guadalajara, invariably I’ll come home with one of their huge containers of cottage cheese and somehow, magically, potato chips appear (If you buy it, they will come) and the house echoes with the strains of some culinary Indian Love Call coming from the heart of my fridge, “When I’m calling you u u u u u u.” And so it is that the unlikely trio are reunited once again, probably late at night when even the dogs are fast asleep and no one is looking. This entry was posted in Essays about food, humorous essay, Uncategorized and tagged Daily Post, Daily Prompt, Essays, essays about food, favorite food, food, guilty pleasures, hate to love, ketchup, Prose, stories about food on December 13, 2015 by lifelessons.